United Nations Special Rapporteur, Victoria Tauli-Corpuz, held a consultation on the Rights of Indigenous Peoples at the UNM School of Law on February 25, 2017. 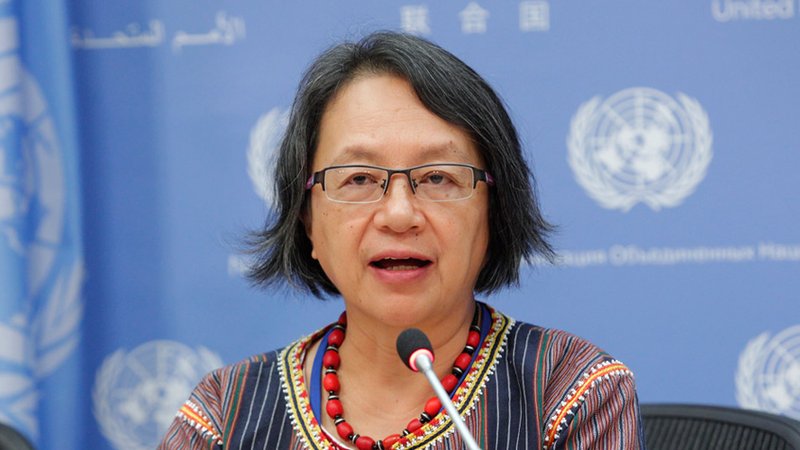 The United Nations Special Rapporteur, Victoria Tauli-Corpuz, is currently visiting the United States attending a series of regional consultations to examine how indigenous peoples are experiencing energy development in their areas. The University of New Mexico School of Law hosted the Special Rapporteur’s visit during a Regional Indigenous Consultation focusing on energy development on Saturday, February 25, 2017 from 8:30 a.m. to 3:00 p.m. in Room 2401 at the UNM School of Law, located at 1117 Stanford, N.E. in Albuquerque. Parking is free at the law school "L" lot on weekends. Participants had the opportunity to present their cases and issues of concern, indicate the topics they are most interested in hearing about, and share any relevant documents with the Special Rapporteur prior to the regional consultation by using the online form (Register Now button) above. Documents were also collected on site.